It's been a long time coming! | NUFC Blog. It’s nice for us to have some home comforts at this festive time of year, and I would guess that it is also nice for the players to have some of those comforts aswell. 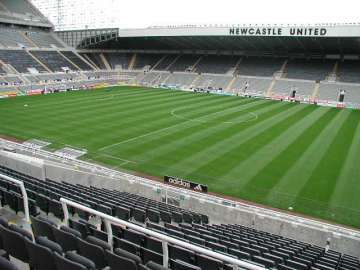 Well this year they can as Newcastle, rather strangely, play a home match on Boxing Day for the first time in nine years. There will be no early starts for the players, no commute of several hours just to make the game, and the same applies to most of our fans, apart from the ones who are travelling a distance to go and watch the game of course. A home game on Boxing Day doesn’t happen very often for us, which is why I’d like those fans going to the game to turn the atmosphere into a Christmas cracker. Traditionally we haven’t had an awful lot to crow about on Boxing Day as results have tended to go against us, but hopefully that will change this Sunday when Manchester City, complete with Balotelli’s silly glove hat thingy, come to St James’ Park. So just what is our record on Boxing Day then? I’ve said it’s bad, but just how bad is it? I was at Sheffield Wednesday last season and witnessed us drawing 2-2 at a snowy and icy Hillsborough, so let’s start there. 2009/2010 – Sheffield Wednesday (a) 2-2 D.
2008/2009 – Wigan (a) 2-1 L.
2007/2008 – Wigan (a) 1-0 L.
2006/2007 – Bolton (a) 2-1 L.
2005/2006 – Liverpool (a) 2-0 L.
2004/2005 – Blackburn (a) 2-2 D.
2003/2004 – Leicester (a) 1-1 D.
2002/2003 – Bolton (a) 4-3 L.
2001/2002 – Middlesbrough (h) 3-0 W.
There you go. That is our run of festive form dating all the way back to when we last managed to grab a win on Boxing Day. Perhaps things will change this time around? Maybe the home comforts can harvest themselves into a nice Christmas present for all those of a black and white persuasion? There is no doubt that this game will provide a stern test for Newcastle. We beat Liverpool last time out, and following that up with a win against Manchester City would be great, brilliant in fact. We are capable of winning of winning this game, much like we are capable of winning any game if we turn up and perform. Let’s hope the lads do that on Sunday and spread a bit more Christmas cheer around Newcastle. TOONSY before i comment,like to say thanks for all the work you and worky put in to this great blog for us to enjoy/fight over,this last year,thanks lads. Still hurting from the 5-1, can’t say I blame you, poor little boy. No they’re not you stupid fat mackem, as we came 16th from 20 in the poll! haha.